Passage in Old Hartlepool, The Headland, England. My great great great grandparents, John and Ann Storey lived at 7 Burdons Passage in Old Hartlepool, The Headland, England from as early as 1861 until after 1881. John, the son of Edward Storey, a fisherman, was born in Thirsk, Yorkshire County, England about 1825. During his adult years, he was employed as an engine smith at the works and a blacksmith. On September 30, 1849, at St. Hilda’s Church, Hartlepool, England, he married Ann Robinson, daughter of George Robinson and Elizabeth Pounder. Ann was born in Hartlepool, Durham County, England in 1827 and baptized at St. Hilda’s Church on December 30, 1827. Census records from 1861 show she was employed as a charwoman. 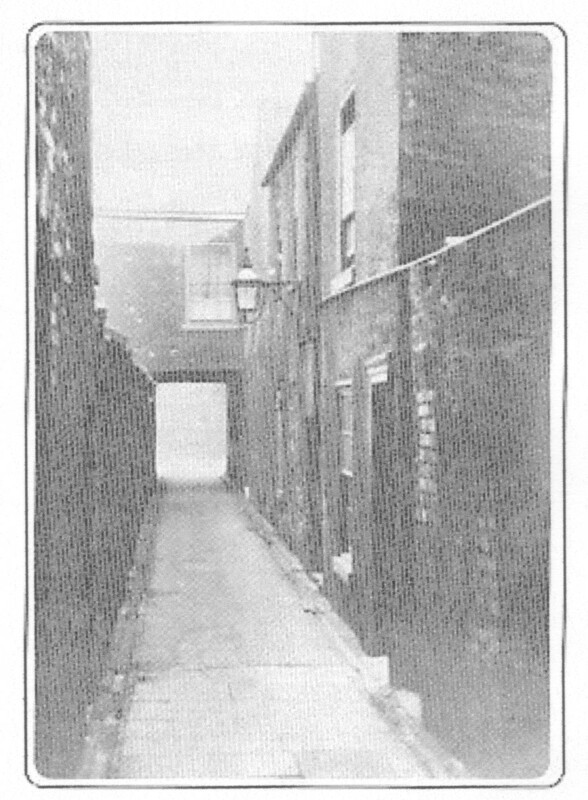 Pictured above is a “passage” in Old Hartlepool, England. Many of the passages, except this one, were crooked and winding. A passage was a walkway located next to the sea wall in Old Hartlepool. They were so tightly packed together that they must have been for pedestrians only. Many of the passages were named for shopkeepers whose premises were located on the far side of the Southgate but whose view was directly along these passages towards the sea. Our Storey family lived on a passage for over 20 years. A second look at the library book from which this definition was taken lists that the passage in the photograph was next to “Storey Passage.” Further research is needed to determine if Storey Passage was named for a branch of our family. Today, the passages are no longer present on the Headland. At the age of 58, Ann Robinson Storey died in Hartlepool. She was buried in the Old Hartlepool Cemetery on the Headland on October 15, 1884. John Storey is listed with his married daughter Elizabeth Storey Moore’s family on the 1891 United Kingdom census. The Moore’s lived near the Hughes family on Hill Street in the Longhill section of West Hartlepool. John, age 66 is still employed as a blacksmith. He died at the age of 72 and was buried beside his wife on August 1, 1897. MARY ANN STOREY, born in 1852 in Hartlepool, The Headland, England; died in March, 1935 in West Hartlepool; married GEORGE HENRY HUGHES on December 25, 1870 at All Saints Church, Stranton, England. Elizabeth Storey, born circa 1859 in Hartlepool, England married James Moore. Their children were: Margaret, Thomas and John. Edward Storey, born circa 1861 in Hartlepool, England, died at age 6 and was buried on July 7, 1867 in Old Hartlepool Cemetery. William Storey, born circa 1865 in Hartlepool, England, baptized on March 5, 1865 at St. Hilda’s Church, died at 15 months and buried on May 13, 1866 in Old Hartlepool Cemetery. THANK YOU to Heather from Middlesbrough, England, my Internet friend, who has done all of the research for the Storey line.